That impression changed dramatically however when we came through the Lincoln Tunnel and entered Manhattan. The woman was still sick, but suddenly there were something to take my attention away from her. For someone like me who’s more or less brought up on American movies, every street and corner in New York is “familiar”. I called my friend and colleague Sarah from the shuttle and reported my arrival. She invited me to join her, her boyfriend and his son at Madison Square Garden for a circus show. I haven’t been to a circus since I was about ten or twelve, and I jumped at the oportunity. After dumping my luggage at the hotel I walked from 57th street down 8th avenue to Madison Square Garden at 34th street. I arrived just in time to meet Sarah and the others and to find our seats before the show started. The show was great! 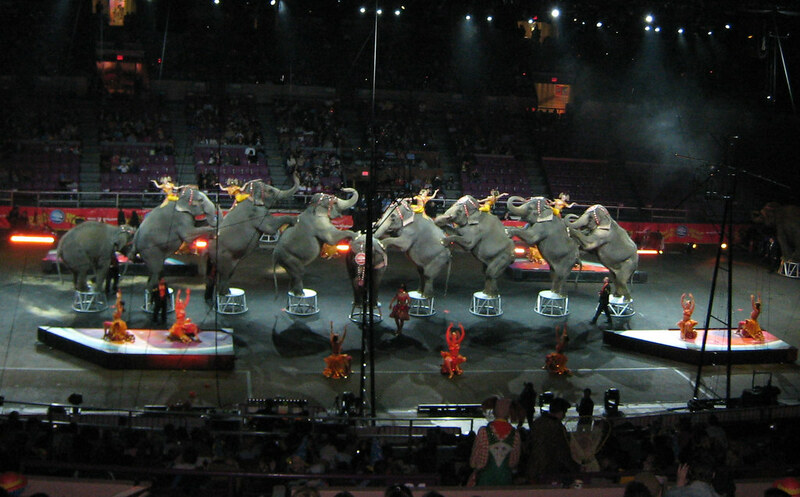 I mean it was a more or less run-of-the-mill circus show with clowns, acrobats, elephants and tigers. Add the American way with singing the national antheme and Broadway style song and dance and you have a pretty good picture. The performers were excellent and some of the stuff they pulled were just incredable! The big hit for all the kids in the audience were the elephants. When ever an elephant showed its trunk on stage the kids went wild. I had an early night and was soundly at sleep before 23:00. Also the enterance to the company where I work is amazing. You can only enter by car! No pedestrian entry, no bus-stop that I spotted anywhere, just everything build for people having a car. – And I live in Basel in Switzerland, where most of the people I know do NOT have a car at all because public transport is excellent and can take you wherever you want.